This book is the first of its kind and the result of a labor of love by the authors, who researched the history of cameos and took over 500 color photographs of cameo jewelry. Over 1400 examples of cameo jewelry are depicted, representing a time span from the 1700s to the present. 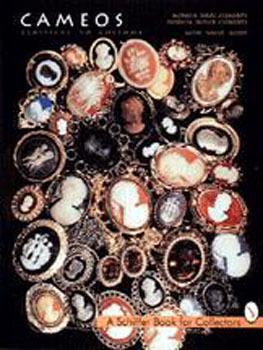 Subjects covered include mythological motifs of classical gods and goddesses, religious subjects and scenes, and the ever-present anonymous woman.A history of the cameo is provided, followed by individual chapters covering each of the materials used to make cameos, including amber, amethyst, glass, jasper ware, lava, mother-of-pearl, opal, plastics, quartz, shell, topaz, and Wedgwood. The beautiful, detailed photographs show the unique artistry and design of the cameos and their settings. This extensive book and price guide will appeal to all who appreciates the cameo's timeless appeal.